Aidan had a follow-up appointment with the pediatric pulmonologist yesterday. To quote him, Aidan "sounds beautiful!" His lungs are really clear and and he sounds good. We have a broncoscopy scheduled for June 11th. Aidan will be put under mild anesthesia and they will pass a scope through his nose down past the trachea and into his lungs. While he is under the doctor is planning to take Aidan's trach tube out to see how he responds and to make sure his trachea doesn't collapse. 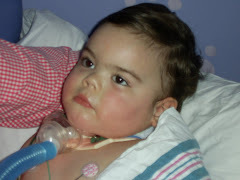 This is just one step closer to getting the trach tube out. 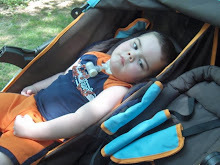 When we get through this and everything looks good, we'll meet with an ENT (ear, nose, throat dr.) to get Aidan fitted for the passy-muir valve that will allow him to breathe in through the trach tube but he will have to force the air out of his nose and mouth. So everything is looking great in that area. I'm excited to think that Aidan will be able to have his trach removed by the end of the summer if everything goes well. Today was the MRI. Everything went well except they had to stick him 5 times to get an IV started. He looked like a little pin-cushion. We probably won't have any results back on it until tomorrow or Friday. He's slept for a good part of the day, so I'm hoping he'll rest tonight. On another good note, Aidan hasn't been having as many "seizures" as he had been having. In fact I don't think I've seen him have any at all today. The nurse said that he had a few last night all provoked by her giving his routine cares (meds, etc.) Other than that, he's done pretty well. Please say a prayer that we get some good news with the results of his MRI. 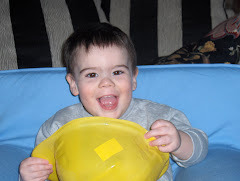 I'm hoping for a miracle and the report to show that Aidan's brain is healing. I just need to know that all of our efforts are paying off. I can see the little changes in him, but it would be great to see them on the MRI films. Praise the Lord for another good doctor appointment! We are praying daily to our Almighty God for excellent, miraculous MRI results, excellent SPECT results, for the trach to be removed before summer is over, for an amazing golf turn-out, a job for Russell, rest and strength for you all, and for little Aidan to be fully, fully restored, running around faster than anyone could imagine. I have a completely ignorant question. Are his seizures physical or emotional? I mean, are his seizures being caused by medical stuff, or are they being caused because he is unhappy about something and this is how he is communicating that? I'm hoping that he'll be able to get his trach out. I imagine that will be nice for you and him. Thanks for the update. Kristina- Your question isn't ignorant. 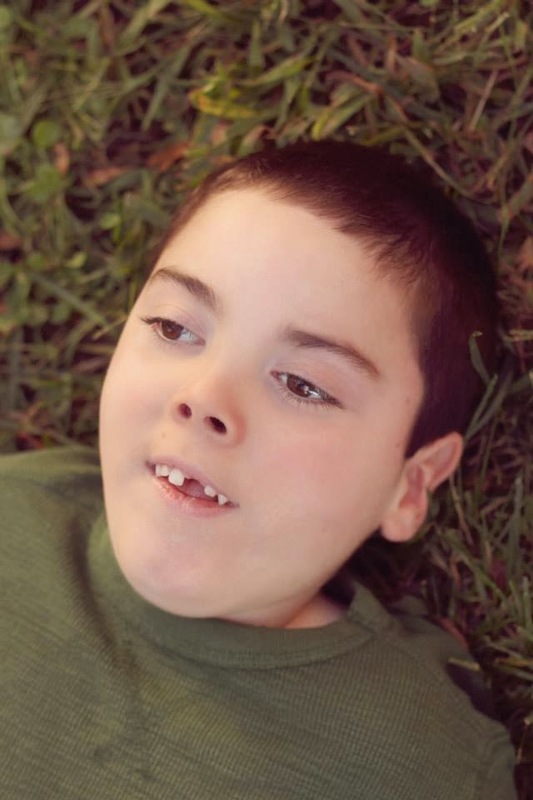 Aidan's seizures aren't consistent. Sometimes they seem unprovoked and other times he will have them if he is over stimulated or in response to being stimulated, like he's trying to or wants to communicate. There is no real pattern to his seizures. He has been showing more control over them. He might jerk a little, like he is going to go into one, but then he's able to come right out of it. Other times he seems to not have any control over them and they last for a minute or longer. I am actually going to call his neurologist today to relay this information to him and to find out about the MRI results. I will post an update when I get those. Thanks for the prayers and well wishes! Praying that Aidan continues to progress and that you get a good report from the MRI. Hopefully he will have the trach out even sooner than planned! Great news that his lungs are so clear. I have a question also. Did they ever check his eyes as they planned before he left rehab? If so what were the results? I know that you had said he followed the doctor with his eyes. I have been praying that his eyesight is still good and that he continues to respond in that area also. We're still praying for Russell to get the right job too, and for your family be restored to a normal life, with two little boys running around playing. I don't post often but continue to read your updates and to pray for your precious family, that God will continue to bless you with strength and peace. I know what you're going through must be so hard to bear at times. You're always in our prayers! God bless! Sounds like good news so far. I will pray tonight that you get good news on the MRI. Give him a kiss for me and Evan too! To answer the question about Aidan's eyes. He has an appointment next week with the neuro-opthalmologist. I think that Aidan is able to see, but I don't think he is able to comprehend what he sees. He does track with his eyes, but it isn't consistent. He follows sound with his eyes much more consistently. He looks in the direction of the person speaking, especially if it is a familiar voice. All of the nurses and the therapist have noted that he responds to my voice more so than he does with anyone else. We'll see how it goes next week, but we really appreciate the prayers concerning the MRI, the trach and his eyesight.